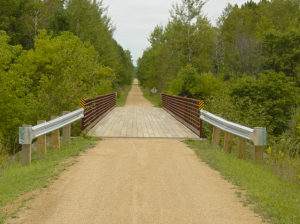 This 98-mile recreational trail passes through Burnett, Douglas, and Polk Counties in Wisconsin and Pine County in Minnesota. Please refer to the Gandy map for more information. Find out how the Gandy Dancer Trail originated at naming the trail. The north-section of the Gandy Dancer Trail extends 51 miles from Danbury to Superior in Burnett County. Northern segment State Trail map, trail and activity information. The south-trail segment extends 47 miles from St. Croix Falls in Polk County to Danbury in Burnett County. Southern segment State Trail map, trail and activity information. The Gandy Dancer trail provides a wide-range of recreational uses. Find parking, restrooms, businesses, and picnic areas at other points of interest. In Wisconsin, the trail is owned by the Wisconsin Department of Natural Resources and operated by each County's recreation department. In Minnesota, the trail is owned and operated by the Minnesota Department of Natural Resources.